MURFREESBORO — The American Red Cross is known for helping to keep Middle Tennesseans and their families healthy and safe. Now with “Pet First Aid,” a guide to preventing, preparing for and responding to emergencies, the Heart of Tennessee Chapter is spreading the word that it can do the same for four-legged loved ones as well. Pet First Aid is a valuable resource for dog and cat owners as well as dog handlers for therapy dogs, police K-9 units and search and rescue units. The new manual includes information for dogs and cats of all sizes, how to keep them healthy, prepare for an emergency, how to recognize and respond to a medical emergency until veterinary care is available. 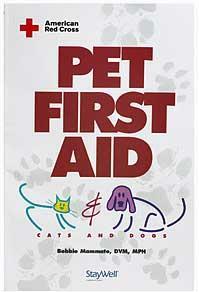 The Pet First Aid book is bundled with a DVD in the back cover that demonstrates how to perform many of the first aid steps described in the book. The DVD is closed captioned for the hearing impaired. “This Pet First Aid manual is also another lifesaving resource that supports our mission of keeping our furry friends and their families healthy and safe,” said Shawn Moore “It’s a perfect addition to home reference libraries and makes a great gift!” For more information or to register for an upcoming course you can log on to www.midtnredcross.org or call 615.893.4272 ext. 102. The Heart of Tennessee Chapter of the American Red Cross provides vital emergency assistance to help victims of local disasters in Rutherford, Bedford, Cannon, Franklin, Coffee & Moore counties. Over the past year the Chapter trained nearly 15,000 people in CPR & First Aid, Babysitting and Aquatics training, and provided pre-deployment briefings and emergency communications for over 640 active duty military personnel and their families. Over 13,177 pints of life-saving blood were collected from the community last year. All of these services are made possible by over 320 dedicated local Red Cross volunteers as well as through generous gifts from the local community. To get more information please call (615) 893-4272 or log on to www.midtnredcross.org.